Inflammation of the lateral epicondyle of the humeral bone (enthesopathia epicondyli lateralis humeri) is commonly called the tennis elbow. This disease entity belongs to a group of enthesopathy, or diseases which affect the muscle attachments to the bones (so called entheses). The main disorder involves the extensor muscles of the fingers and wrist, attached to the lateral epicondyle of the humerus (usually the extensor carpi radialis brevis). It manifests itself as the pain within this area, which significantly impairs the functioning of the upper limb. The cause of the disease and the related disorders are degenerative changes, primarily the damage to the collagen fibers forming the tendon, as well as the abnormal blood supply to the point of tendon attachment to the bone, caused by micro-injuries and the chronic overload. 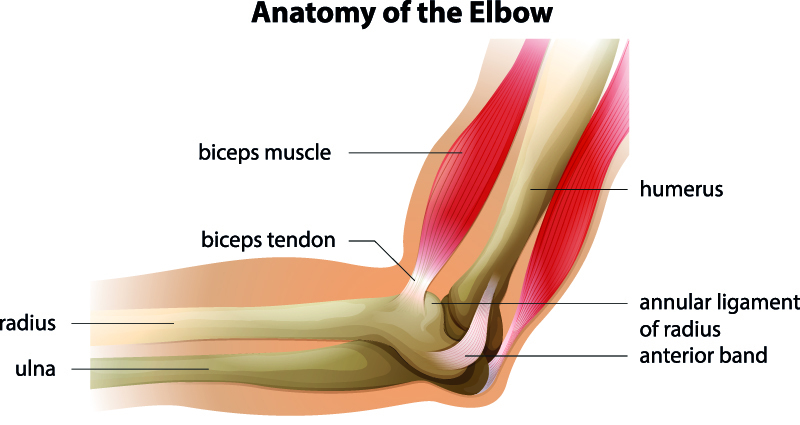 Tennis elbow affects about 3% of the general population. People who are most vulnerable to this tendinopathy, or other tendons diseases, are those between 30 and 65 years old, although the most numerous group includes people of 45 - 54 years of age. Inflammation of the lateral epicondyle of the humerus mostly affects people performing daily the repetitive movements which exert load on the wrist extensors attachment (alternate extension and rotation of the wrist) . This group include office workers, secretaries, IT specialists, who, while working at the computer, keep a specific position of hands, but also electricians, performing the movements of the wrist with a strong grip of the hand while clamping the screw, or a person lifting heavy objects with straight elbows. The smokers are also exposed to a tendinopathy to a considerable extent. As the name of the disease may suggest, this condition also affects tennis players, but they constitute only 10% of all patients. The reason here is the dorsiflexion of the wrist (upwards) and tension in the muscles that occurs in almost every type of the ball drive. Players suffering from inflammation of the lateral epicondyle of the humerus show an increased activity of the wrist extensor muscles while hitting the ball and just after it. This may be due to the incorrect techniques (when the movement is mainly generated by the wrist, instead of torso and shoulder ) , and therefore this condition is often diagnosed in amateurs rather than professionals. It occurs most often among the players performing the backhand stroke with one hand ( in the case of performing the two-handed backhand the large amount of energy is absorbed by the second, non-dominant upper limb ). In addition, the tendinopathy in tennis players is more likely to develop in the players who have low body weight , use the wrong technique , play with small head size rackets having the wrong pull strings or the tennis court surface is too hard. In addition to tennis players, this disease also affects the players of badminton or squash. One of the most persistent symptoms of tennis elbow is the pain which occurs on the outer side of the elbow. This is a type of pain radiating to the forearm and the wrist. It usually becomes more severe during the attempts to clench the hand or during the resistant wrist dorsiflexion , therefore one of the most important element of the medical examination (apart from the medical interview) are the resistance tests (the manual muscle strength testing of the hand muscles). Also, the tenderness during the palpation examination occurs, as well as difficulties in activities of daily life, such as raising a glass or door opening. The specialists of the International Academy of Orthopedic Medicine - Cyriax and Winkel distinguished 5 types of tennis elbow, depending on the kind of tendon affected by the disease. Type V - the disease process affects the initial attachment of the extensor muscle of fingers. In approximately 80 - 90% of cases the recovery takes place within a few months , however, it depends on the duration of symptoms, the nature of the degenerative changes and the previous occurrence of this type of episodes and the applied therapies. In case of the occurrence of the typical symptoms, the improvement of the playing technique, as well as the avoidance of a prolonged computer work is recommended. The aim of the treatment is to alleviate the pain symptoms, increase the muscle strength and improve the functioning of the upper limb. During the exacerbation of the process the complete immobilization should be avoided, as this may lead to a decrease in the muscle strength or even the atrophy of muscles. The so-called self-treatment can only be applied to the second and fifth type of tennis elbow. In prophylaxis, the most important thing is to learn the proper technique of playing tennis. The position of the body when hitting the ball and the head size of the racket are the basis. Avoid a long term standing position, especially when working in front of the computer. The muscles after exercise need a dose of nutritional ingredients, and the joints need a rest and replenishment of deficiencies such as hyaluronic acid and chondroitin.